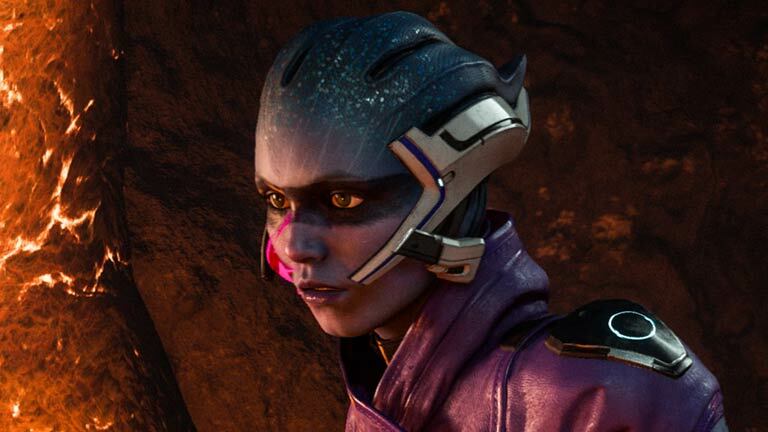 Peebee is a Character in Mass Effect Andromeda. Peebee walks to her own daredevil drumbeat and has an unrivalled thirst for adventure. She’s pathologically independent but manages to maintain a loose, even friendly spirit. Bored with the Milky Way, she would have done anything to join the Initiative – flirt, favors, fudged credentials. But to her, she was just hitching a ride to the great unknown. When inside the Tempest, speak to Peebee near Escape Pods and choose "You crave excitement, huh?" option. Then speak to her inside the Tempest and choose "Flirting." option. After you acquired a piece of rem-tech that Peebee needs speak to her near Escape Pods and choose "It's true." option. Complete A Trail of Hope and speak to to Peebee on Aya. Speak to her near Escape Pods again and choose "I'd want strings." option OR accept and start non-commital fling. Speak to Peebee about Kalinda and visit Kadara, then speak to Peebee again and meet her on the Tempest Bridge to start a Loyalty Mission. Compete her Loyalty Mission and speak to Peebee near Escape Pods. Then leave the Tempest at least once and speak to Peebee near Escape Pods and in the Meeting Room. Can commit to relationship here. After the mission The Journey to Meridian go to Pathfinder Quarters and interact with the gift.